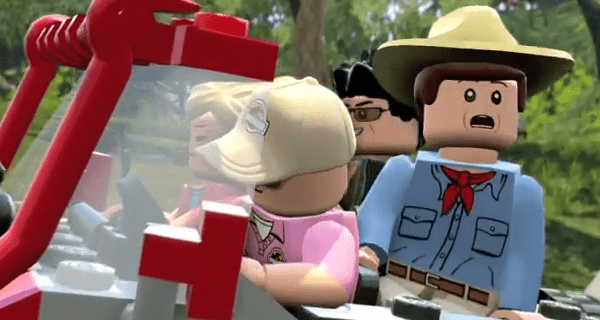 LEGO Jurassic World, punch a dinosaur, shoot Jeff Goldblum – explore the iconic park the way Spielberg probably didn’t want you to! Last Friday, a few colleagues and myself felt vastly swept up in all the dino-mania that’s taken the world (and Box Office) by storm and decided to go catch the new Jurassic World film at the cinema. I spent £6 on a Pepsi (just so I could keep the plastic drinks’ cup with a detachable dinosaur on top) and about £15 on a 3D ticket. Hated the film; it bored me to tears with its dumbness and I left feeling as if they barely scratched (no pun intended) the surface of what made the original so captivating. Alas, when LEGO Jurassic World turned up on my doorstep I was as trepidatious as a Diplodocus hanging above a Mosasaurus on a Saturday afternoon. I think that analogy alone deserves a hand… Just not from a T-Rex eh? Get it? Because they have little arms? Oh, I give up. The first thing to mention is that unlike 80% of games released today on next-gen consoles, as soon as you insert your disc into your console it is ready to play almost immediately. The games’ content isn’t inferior by any means either, it’s just a neat and tidy way to get gamers into Jurassic Park without any frustrating hour-long waits while you download a 60GB patch. This is important for what is essentially a children’s game. My fears and woes regarding a poor movie tie-in game were soon put to bed; the grand orchestral theme music sweeps in early doors accompanying your initial prologue stages of the game to fantastic effect. I was sat hooked like a child reading a good book – humming along the two recognizable theme tunes every time they supported a superb piece of action. The beauty of the LEGO franchise is its humor. Sometimes it’s a bit tame, sometimes it’s vastly adult – yet most of the time it always hits its mark with great accuracy. Initially I feared how they were going to make rampaging monsters tearing limbs off poor victims hilarious – yet somehow they do. There’s no blood or guts (it’s completely child friendly), yet you’ll often find characters will be thrown around by dinosaurs and occasionally the Indominus rex will show you a tough time, bashing you around in your gyroball like it’s on crack cocaine or something. The game covers the events of Jurassic Park, II: The Lost World, Jurassic Park 3 & Jurassic World – all with great warmth and dedication to the source material. I played through the game chronologically with a friend and each new episode was a blast – perhaps the Lost World segment was notably the weakest part if I’m being picky. The most entertaining moments were when the game takes a scenario from the film and has fun with it – take the raptor sequence at the end of Jurassic Park for example, or indeed the pretty harrowing scene in the original where Dennis Nedry gets venom-ed on by a Dilophosaurus. All these iconic moments are lovingly brought to life with some LEGO magic. Like most LEGO games, I feel these are the moments gamers are actively working towards as they play through a lot of superfluous content. It feels like there’s golden nuggets scattered throughout each title (LEGO Star Wars, Batman, Harry Potter etc.) and you have to wade through a fair chunk of tedious gameplay to reach them. This isn’t a problem for children, they’ll have a blast punching their siblings to death on co-op, collecting all the nuts and bolts that drop out of crushed blocks – heck, they’ll probably enjoy the fact you can play as the dinosaurs too. For adults, however, while the cinematic moments are highly entertaining and the original soundtrack is here in all its glory – the gameplay will soon become tedious and you’ll eventually scratch your head wondering why so many children are dedicated to completing such frustrating puzzles. My qualms with the gameplay are ultimately redundant though. LEGO has a solid fanbase and has perfected a formula that seems to work year upon year. I’d rather play through something like LEGO Jurassic World, something joyful and entertaining, rather than the repetitive Call of Duty franchise which actively frustrates me with its lack of innovation each year. The graphics are top notch, the variety of playable dinosaurs are exciting and as several moments from each film are perfectly executed in LEGO mayhem, I would argue this is perhaps the most entertaining LEGO videogame to date. While I love the soundtrack, I did occasionally find some of the cut scene audio difficult to hear. Depending on which movie you play through, you may either have to strain your ears to hear lines ripped from the original film (wonderfully nostalgic yet terribly difficult to gauge) or you’ll find you end up playing a guessing game half the time as there’s an odd mish-mash of genuine lines/new voiceover in Jurassic World. I’m pretty sure I recognised the Bryce Dallas Howard and Jake Johnson lines ripped straight from the new film – yet I’m convinced Chris Pratt’s voice is just a very good impersonator. Kind of ironic considering he was in the hugely successful LEGO Movie. Overall LEGO Jurassic World is an extremely fun family game that takes some of the open-world aspects from LEGO Marvel Superheroes and jazzes them up with some Jurassic lunacy. 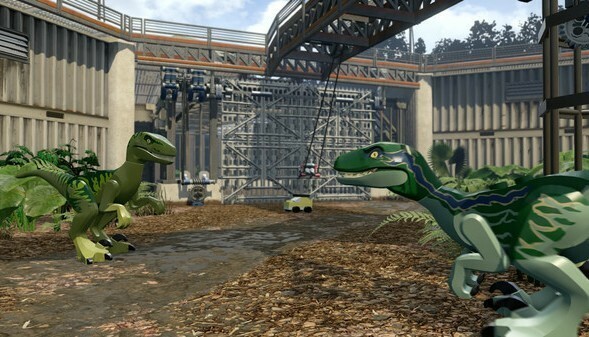 From children who enjoy the spectacle to adults who enjoy the nostalgia, there’s something for everyone in LEGO Jurassic World. The gameplay may often get repetitive and the puzzles occasionally frustrating, however it’s the joyful tone of the piece and the sublime soundtrack that makes this one memorable. With plenty of side missions, collectables and some great co-op play, this is a highly recommendable game full of replay value for the younger ones. All I can say is – thank God it was better than the movie.